Hi! Have a brownie :) They turned out really good, moist and slightly cakey. I substituted one of the eggs in a two egg recipe for...yep, you guessed it..yogurt. 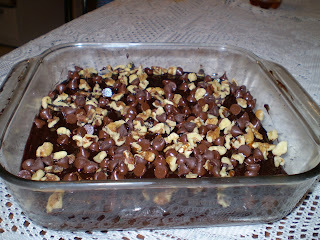 I throw all the nuts and goodies on top because you can use less, (I used 1/2 cup each instead of a full cup, 50% less), and it seems like more if it is not hidden in the brownie batter. I also use a glaze, about two tbsp instead of a full icing recipe. Less is more, I say. I'll give you the recipe, just leave a comment, but be warned, I have altered it. Every time I make something I switch it up, depending on what I have in the pantry. No one notices these little things as they are devouring the chocolatey goodness, and it saves me ingredients. I am running low and I did not manage to make it to the farmer's market as I planned this morning. I have been on the phone all morning, scheduling appointments for my son. I got myself a part time job. I am so happy because I will be able to begin our budget and debt snowball with even more confidence. There will be added expenses that come with working but, let's face it; an increase to the monthly income is a good thing. I just hope we don't go too crazy with the packaged foods, that's been a big cost in the past. I will have to be a bit more organized than I have been before. I think I will have to become even more creative with less time on my hands to remain in the frugal ways. We have started to become accustomed to the simplicity of such things as fresh bread from the bread maker (me, ha ha), homemade goodies and the like. I don't want to give it up, for spending hard earned dollars on fast foods and junk, so think I will have to manage my time better. I won't be able to be as spontaneous, (ooh, let's make cookies, it's 9.pm!) but more disciplined in my planning. My menu plan my have to become a little more specific as to include lunches and breakfasts, for example. No more winging it, I guess. Oh well, I have many good blogs from which to draw my inspiration, and much to learn. Oh, jeez, I gotta get in the shower! Hi! I stumbled upon your blog and LOVE it! You are an inspirational writer and I'm learning so many new things. Great posts :) I'm officially following you!